Your Grace is Sufficient: Homily for the Third Day of Parish Novena 2016: "Mary, Mother of Mercy"
Homily for the Third Day of Parish Novena 2016: "Mary, Mother of Mercy"
The very notion of plurality in a singularity, that is, three in one, is already an abomination for strict monotheism. What is more, in the context of Islam as practised here, the mention of Mary and the Trinity in the same breath could send an ignorant or unthinking Muslim jumping to proverbial conclusion that the Trinity equals to the Father, the Son and Mary. Today is not the day to defend against this deficient and flawed understanding but to deepen our own knowledge of the role of Mary within a framework of the Trinitarian revelation and our response in faith. In short, where does Mary fit into God’s revelation of Himself as Three distinct persons and yet one God? What relevance has she for each one of us if we are to accept this revelation? In Lumen gentium, which is the Dogmatic Constitution on the Church, we realise that Mary is placed within the context of the Trinity. Part of #53 states that “redeemed by reason of the merits of her Son and united to Him by a close and indissoluble tie, she is endowed with the high office and dignity of being the Mother of the Son of God, by which account she is also the beloved daughter of the Father and the temple of the Holy Spirit”. Here you have it, Mary is not a goddess within the matrix of the Trinity but is endowed with the high office and dignity on account of her being the Mother of the Son, Daughter of the Father and Temple of the Holy Spirit. She is the Mother of God and the Mother of the Redeemer thereby placing her at the heart of God’s merciful plan of salvation. Thus, Mary is the tender Mother of Mercy or if you prefer, the Mother of Tender Mercy. Today, for want of an inspiration, I am going to be a mere mouthpiece for a specific style of iconography. 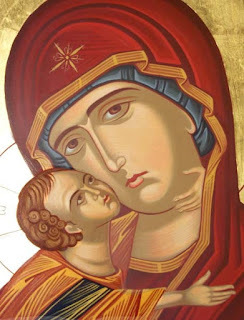 To begin, the most famous icon we know in this country is Our Lady of Perpetual Succour or Help—This icon belongs to a style known as Theotokos Hodegetria or Our Lady of the Way or Santa Maria della Strada. The style or the rendering of the Hodegetria is more formal as she carries the Child with one hand and points to Him with another. Check out the OLPH. This evening, our accent or focus, in line with the Year and Theme of Mercy, is on Compassion, Mildness and Tenderness. For this we turn to another genre of Greek icons called the Theotokos Eleusa. Eleusa, in Greek, as you hear in Kyrie eleison, is mercy. Firstly, the icon depicts the tender affection that exists between Mother and Son. Their faces touch each other and here, the Child has one of His arms around the Mother’s neck symbolising both His vulnerability and also His dependency. They appear thoughtful as they rest together—a picture perfect rendition of the love between a mother and her child. What does this Mother of Tender Mercy have to do with each one of us? Earlier, we established that Lumen gentium (#52) sets Mary in the heart of the Trinity. However, the same document also places Mary within the context of the Body of Christ, with Christ as the head. In her "the faithful are joined to Christ the Head and are in communion with all His saints”. Christ draws all men to himself. Through her motherhood, she is closely associated with her Son, thus, Mary helps direct the gaze and heart of believers towards him. As Pope Francis reminds us at the launch of the Year of Mercy that Mary, as one who has entered the sanctuary of divine mercy, will never tire of turning her tender and merciful eyes towards us and make us worthy to contemplate the face of mercy, the face of Jesus Christ her Son. It is when we turn to Mary with that loving trust as shown by the Child Jesus then we can be sure that she will lead us directly into the sanctuary of mercy. After Mass, we shall go out to make our first procession of the Novena with the Statue of the Blessed Virgin Mary. I can tell you that personally, I shy from doing it. I hesitate not because I am apprehensive that it borders on idolatry. Instead my reluctance betrays firstly my lack of faith in God and secondly it reveals or uncovers what I had spoken of two days ago—on comforting the afflicted or consoling the sorrowful. If you can recall a 70s series—The Six Million Dollar Man—with a tagline goes like this: “We can rebuild him; we have the technology”. Like it or not, we are children of the Bionic Age. We are uncomfortable with dependence because our notion of personhood rests on the myth of the self-made man or woman. The only genuine “ME” is when I can do things for myself. This mentality easily translates our relationship with God as one of last resort and not first instance. Often, we turn to God only as a last resort and only after we have failed in our plans. Maybe you understand why parents nowadays prefer to stay away from their children. They would rather salt away enough money so that they do not become dependent on their children. We frequently give consideration as the reason for this decision but deep inside, the idea of the self-made man or woman actually heightens the fear of frailty, incapacity and failure—a fear which drives some elderly to hide from their loved ones. We do not really want our loved ones or those who matter to us to see us at our weakest, do we? If everything in your life is proceeding according to your plans, thanks be to God. But I doubt that this is the case. So, if you find yourself at a cross-road in a situation where you are stuck with nowhere to turn, then the procession is a walk of faith, a surrender to the love of a Mother who knows what it is like to be bereft of strength. Mary, in her nothingness trusted that He can do great things for her. Therefore, when we are incapacitated because we are gripped by the fear of failure or powerlessness, we ought to turn to Mary, for at her feet, she will scoop us into the maternal fold of her merciful love. Finally, the procession may not solve any of the problems that you face though I am certain that our surrender in faith, and comforted by the Mother of Mercy, we will gain us the grace of strength to face life with all its trials and tribulation. Do not just walk or descend into chatter but pull out your rosary because the heart of the Church pulsates with a Marian beat. Know that as you accompany Mary, she also joins us as we contemplate her mysteries, the very merciful mystery of Her Son who is our Lord and Saviour waiting to our response to His gift of salvation. In many cases, the iconography reflects the exalted position of Mary. In scenes of the crucifixion, she is always depicted as standing on His right side. In Church architecture too. Mary’s altar, from the perspective of Christ on the Cross, on His right and the viewer’s left. But, whenever, there is an altar dedicated to the Sacred Heart or the Divine Mercy, then Mary’s altar will be situated, from the perspective of the viewer, on the right—which is traditionally dedicated to Saint Joseph. In the Hodegetria of Our Lady of Perpetual Succour, she carries Him with her left hand so that she is to His right. However, the illustration used today is taken from Our Lady of Vladimir and the position is not the same.